Arsenal missed the chance to go top of the table as Everton rediscovered some much-needed self-belief to come from behind and score a late winner at Goodison Park. Only their second victory in 11 Premier League matches was secured by the head of Ashley Williams in the 86th-minute as the defender picked the perfect time to score his first goal for the club. Earlier, a deflection off Williams from Alexis Sanchez's shot had put Everton behind, but they fought back to prevail 2-1. It represented an impressive turnaround from a side who looked resigned to being second-best to the Gunners during the early stages, only for Seamus Coleman's header just before the break to boost their confidence levels. 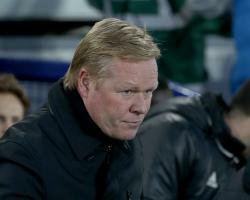 The win relieved some of the pressure on manager Ronald Koeman, who brought back Phil Jagielka, Ross Barkley and Aaron Lennon, and handed Enner Valencia his first Premier League start since arriving on loan from West Ham in the summer but, with a Merseyside derby to come on Monday, left out Gareth Barry. It also ended Arsenal's unbeaten league run stretching back to the second weekend of the season as they failed to take advantage of a comfortable opening 20 minutes in which, after the unmarked but off-balance Mesut Ozil ballooned over, Arsenal were dominant and Everton compliant. The general perception that it would be when and not if the Gunners scored was realised after some haphazard and comical defending. Williams clattered into team-mate Idrissa Gana Gueye as he panicked to clear, allowing Francis Coquelin to draw Phil Jagielka into a soft foul on the edge of the penalty area. Williams compounded his mistake as he appeared to be taken by surprise by Sanchez's low free-kick around the wall, allowing the ball to hit him to divert it past the wrong-footed Maarten Stekelenburg. The Chile international has now scored or assisted 27 goals in his last 27 league matches, netting 19 of those. Apart from Valencia - who threatened Arsenal's defence with a couple of driving runs despite being posted as a wide midfielder with more than one eye on defensive duties - it took over half an hour for Everton to realise they would have more joy if they pressed and pressured the visitors. They gradually dragged themselves back into the game with Aaron Lennon wasting two good opportunities, the second from close range after Nacho Monreal mis-kicked Barkley's free-kick. Everton's momentum looked like being scuppered by half-time but a minute before the break Leighton Baines' inswinging right-footed cross was headed home by fellow full-back Coleman after James McCarthy had cleverly manoeuvred Laurent Koscielny out of the way. The interval did indeed burst the hosts' bubble as Ozil began the second half as he did the first, firing over unmarked but it was not long before Everton remembered what had served them so well in the opening 45 minutes as they swarmed all over their opponents with an intensity which has been lacking for several weeks. Valencia, seemingly making up for lost time, and Coleman ran relentlessly up and down the right flank while McCarthy, Gueye and Barkley did their jobs in midfield. Late on Jagielka's shot was palmed away by Cech - his first real save - but from resulting corner Williams' downward header lifted the roof off Goodison Park. Tensions increased as Jagielka was sent off for a second bookable offence in added time but it still needed a Baines clearance off the line even later before the celebrations began.